Protesters interrupted a council meeting in opposition to a planned £93.8m link road between two East Sussex seaside towns. Opponents of the 3.4-mile Hastings to Bexhill link road claim it will destroy the unspoilt Combe Haven Valley. 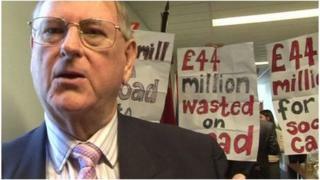 Demonstrators at East Sussex County Council's headquarters, in Lewes, also objected to the council spending the money while cutting services. However, the authority said the road project would create thousands of jobs. Andrea Needham, from Combe Haven Defenders, said: "People are fed up that the government has decided it will go back to the road-building programs of the 1990s." However, council leader Peter Jones said: "It [the road] will create 2,000 new homes and 3,000 new jobs. "And would these people deny that to the most deprived community in the south east of England? They want to take away people's jobs and homes." Earlier in October the Hastings Alliance campaign group failed in its bid for a judicial review of the government's decision to contribute £56m towards the project. Construction is due to start in January after the government approved Compulsory Purchase Orders for the land in September.